With Columbus Crew SC seeking to relocate to Austin, operator Precourt Sports Ventures has unveiled an Austin FC badge. After considerable debate, the Austin City Council voted last week to approve the term sheet for a McKalla Place land lease, clearing the way for Crew investor-operator Anthony Precourt to finance a $200 million MLS stadium at the city-owned site. It is still up to city staff to convert the term sheet into a finalized lease, but it was a step forward in Precourt’s effort to move the Crew to Austin. 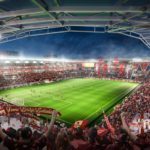 PSV has discussed moving the Crew to Austin as early as 2019, a decision that would lead to the club playing at least two seasons at an existing venue in the area until construction on a new stadium is complete. That relocation plan is not at all finalized at this point, but unveiling the Austin FC logo is one step that allows PSV to plan ahead if Austin gains the needed approvals. It should be noted that there are still some loose ends in Columbus: the city has invoked the so-called Modell Law, created former Cleveland Browns Art Modell owner moved his NFL team to Baltimore. The state law was designed to prevent franchise moves and give locals a chance to buy any team playing out of a taxpayer-supported facility. But so far no local group has stepped forward to make an offer to buy the Crew, and taxpayers did not build MAPFRE Stadium: it was financed by Lamar Hunt and Hunt Sports. A hearing about the application of the law here is set for September 4. Under the terms of the agreement in Austin, Precourt would privately finance a $200-million stadium at the McKalla Place site, with the city retaining ownership of the land. As a result, PSV would not pay property taxes on the stadium and surrounding amenities, but would pay annual rent through a lease with the city.